These pointed-toe leather heels feature laser cutouts and leather lining at the toe and heel cap. 3/4" hidden platform and 4.25" covered heel. Leather sole. With cutting-edge styling, a fresh-off-the-runway look, and European-influenced design, ROSEGOLD can make any outfit look of-the-moment. Uptown or downtown, day or night, and at any occasion, this alluring collection fits the fast-paced lifestyle of the woman who knows fashion, appreciates luxury, and demands the highest quality, all at an accessible price. 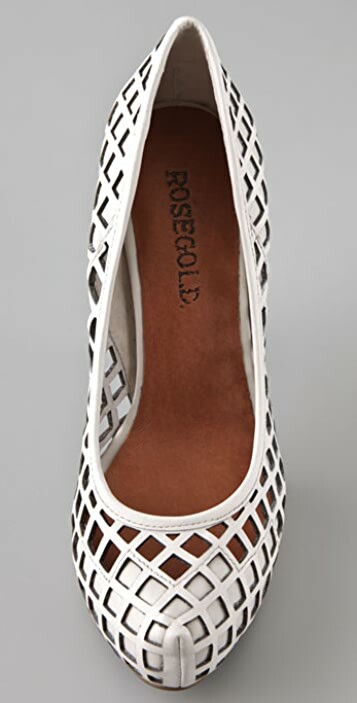 ROSEGOLD shoes are bound to become a must-have for every fashion-savvy woman.